I got this recipe a few years ago from listened dhamma from the Thai monk, named Luong pah Jarun on YouTube (sorry, if I spelled his name wrong. I really don’t know how to spell his name in English language), and I did not know him personally. He said; banana tea is good for the people who have stomach problem, stomach ache, stomach cancer, and intestinal cancer. Itwill help to heal effectively, or not, I don't know, but it not hurt to try, because of it all natural. Everybody can drink the banana tea, it's not just for the people who have stomach cancer, or stomach problem, but for everyone, because banana tea may help to prevent you from cancer also. 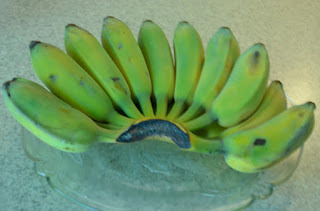 Banana has many health benefits, but I’ll not talk about the health benefit of banana today, because you can search and find the information all over on the internet.